* PLEASE NOTE : THE FORMS FOR REGISTRATION, ABSTRACT SUBMISSION, TRAVEL FUNDING AND ACCOMMODATION RESERVATION ARE ON THIS WEB PAGE. DON'T FORGET TO FILL THEM OUT! You will then arrive on the confirmation page of the amount to pay for your registration. Breakfasts, lunches and coffee breaks from july 18 to 20, networking cocktail (july 18), banquet (july 19), presentations and activities. There will be a «Break the ice» Happy Hour on the evening of july 17 at the local pub Le refuge des Brasseurs. Food and drinks during the Happy Hour are not included in the registration price. ”Diversity afternoon” package only includes participation to activities, lunch, afternoon coffee break and networking cocktail of july 18 (from noon to 9pm). Accommodations *** See affordable accomodation options below. Travel expenses *** Travel funding is available. See information on the application process below. Cancellations are subject to a $30 CAD administrative charge until June 30, 2018. Cancellations after June 30, 2018 and no shows will not be refunded. You want to share your research results and practice your communication skills? Present a poster or give a talk during the conference! Awards will be given for the best presentations and posters! There is a limited number of spots for the oral presentations, therefore there will be a selection based on the quality of the submitted abstract. Abstracts for talks and posters should be 300 words or less. Talks slots will be 10 minutes + 2 minutes for questions. Posters should be A0 format (84.1 x 118.9 cm). The vertical orientation is preferred. To submit an abstract for a poster or a talk, please fill out the following form for May 20, 2018 at the latest. Since it is a nation-wide conference, the preferred language for abstracts, oral presentations ans posters is English. However, French is also accepted. Applicants will be informed of the acceptation of their abstract by e-mail around June 1, 2018. A budget describing your expected expenses and any funding source you have access to (maximum 1 page). Fill out the travel funding form and include those 3 documents for May 20, 2018 at the latest. Applicants will be advised of the committee’s decision by e-mail as of June 6, 2018. IMPORTANT : We strongly encourage carpooling (in particular for people of Quebec and some parts of Ontario). A transport will be organized from the Montreal airport for participants traveling by air. Don’t forget to mention your needs regarding transportation in the registration form. Applicants will be advised of the committee’s decision by e-mail as of June 1, 2018. Many accommodation options are available. The registration fees do not cover accommodation expenses, and the travel funding is not applicable to accommodation expenses. A set of rooms has been reserved at the Université de Sherbrooke’s main campus residences for the nights of July 17, 18 and 19. To book a room, you have to fill out the accommodation form below and complete the payment. Every room includes bedding, towels and shower products, a desk, a wardrobe, a refrigerator, a fan, Internet access, parking, and access to common rooms. Each level has 8-9 rooms and 4 individual bathrooms, for the whole level. Room in double occupancy (2 twin beds) : CA$36.89/person/night, including taxes. Room in single occupancy (1 twin bed) : CA$53.55/person/night, including taxes. If you opt for one of these other options, please note that transportation to and from the conference site is not included. We have reserved a set of rooms at preferential rates in some Sherbrooke hotels. 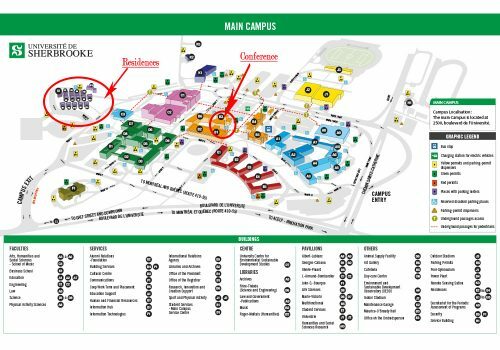 Please note that transportation between the conference site and those hotels is not included. Information on available transportation follows. Rate : 169.00 $ per room / per night, single or double occupancy + taxes + 15.00 $ per additionnal person, no fees for children 12 and under. Reservation should be made by phone at 1-888-999-3499 or by e-mail : reservationsherbrooke@timeshotel.ca. A credit card number will be necessary. Reservations can be cancelled without penalty up to 7 days before check-in. You have until June 17 2018 to reserve at this preferential rate. Interior/exterior parking: 10$ + taxes / day/car. Rate : 114.95 $ per room/ per night, single or double occupancy, + taxes. Reservation should be made by phone ONLY, at 1-800-363-2941. Reservations can be cancelled without penalty up to June 17 2018. Room in double occupancy (2 twin beds) : CA$36.89/person/night, + including taxes. Room in single occupancy (1 twin bed) : CA$53.55/person/night, + including taxes.